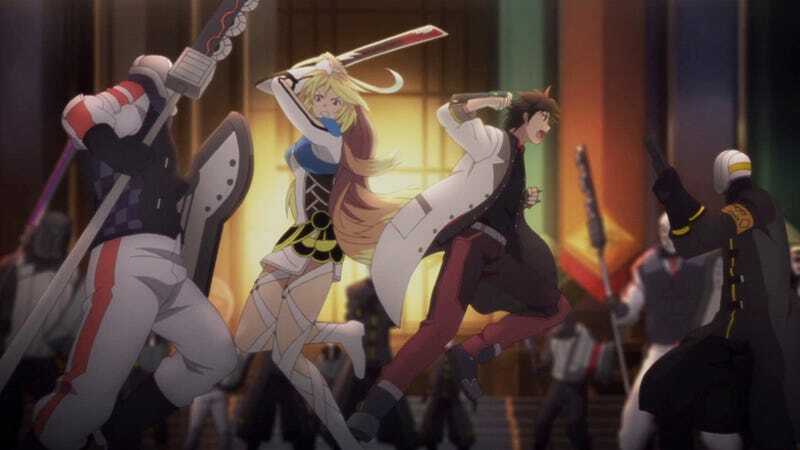 Back in June, Bandai-Namco announced that Tales of Xillia, the first Tales game designed specifically for the PS3, would be heading to America, Europe, and Australia in 2013. But while Western fans can do nothing but wait anxiously, Japanese fans have had time to play not only the original game but also its sequel. Tales of Xillia 2 was released in Japan a month-and-a-half ago and is in many ways an improvement over the original. But sadly, it seems for every step it takes forward, it always takes one back. The plot of Tales of Xillia 2 involves the existence of pocket parallel universes expanding dangerously into the main timeline. The characters' job is to go into these pocket universes, find the cause of the divergent timeline, and destroy it. This, of course, has the side effect of destroying the entire alternate timeline as well. The main characters—all good people—struggle constantly with the moral quandary of destroying universes to save their own. Some look at these as shadows of the true reality, and thus the people inside are not real. Others feel it is wrong, but are not willing to let their reality die. And when one character actually escapes her doomed reality, the whole situation gets far more complicated. If there is one problem with the story, it is that the main character, Ludger, is the least interesting character of the group. His struggles seem tame when compared with what the returning characters are facing; and having the game focus on him can be, at times, frustrating. However, the game counters this by having many character specific "episodes." These side quests do a great job of diving into the (far more interesting) stories of the other characters. completely. In addition to magical weaknesses, the enemies now also have weapon weaknesses. Heavily armored enemies are weak to a crushing hammer blow; quick enemies are best dealt with by swords; and small fliers, on the other hand, are most susceptible to guns. All non-magic special attacks—as well as normal physical attacks—fall into one of these types of categories. The main way the game keeps battle interesting is by constantly switching up the compositions of the groups of enemies you encounter. and away the strongest and most versatile character in the game. Moreover, Ludger is the only character capable of using the game's new "limit-break" style system. When the gauge in the corner fills up (which takes about thirty seconds), Ludger can transform into a form that does amazing amounts of damage and makes him invincible. As most boss battles are built with his "limit breaks" in mind, playing as any other character is a great handicap. Simply put, while the weapon shift and limit-break systems make the game fun to play, playing as anyone but Ludger is denying yourself the strongest weapon in your arsenal. are useless and affect nothing, one way or the other. Beyond the dialogue scenes, the only sounds Ludger makes are a series of screams and grunts. In a game like Zelda where no one has a voice—or in a game like Portal 2 where the other characters make fun of your mute status—this would be fine. But in a game where everyone is voiced but the main character, it comes off as odd. However, I am apparently not the only one who thought this. Upon completing the game you can unlock his voice in new game plus; thus whenever you make a choice, you get to hear him deliver the line. I can only wonder why this option isn't available at the start. Hands-down the worst part of Xillia 2 is your mob-loan. Early in the game, you find yourself with a staggering $20 million debt that you must pay off over the course of the game. Whenever a certain amount of time has passed or you have made a certain amount of money (the upper limit of how much you can hold goes up as you play), you must pay off a portion of your loan. While the side-tracking activity of loan payments is a bit annoying, this is nothing compared to how the debt is used to pad the game's length. After nearly every main story chapter, your mission goal becomes "pay off the loan." Cash becomes king and you must then spend at least an hour or two doing hunting quests and grinding for gold. This is by far the most aggravating attempt to pad a game I have seen in a long while. It easily doubles the length of the game and is pure torture for anyone invested in and/or eager to continue the story. A good 90% of all the maps, monster types, and even bosses are ripped straight out of the original Tales of Xillia and reused here. Many maps are not changed at all—not even a light-filter change or a season change to make it appear different on the surface. Thus the exploration that was so key in the original Xillia is now missing. Exploring every nook and cranny is no longer an adventure, it's just a halfhearted retracing of your steps as you collect loot. Tales of Xillia 2 is one of those games that does both a lot right and a lot wrong. The battles are fast and fun, and the weapon change mechanic keeps them interesting. However, the fact that you will spend countless hours in battle doing nothing but grinding for gold—and that you will spend those countless hours as Ludger or else be greatly handicapped—serves to drain most of the fun out of it. And while the moral quandaries and character conflicts are quite deep, you'll spend much of the time on Ludger's more superficial problems instead. Really, Tales of Xillia 2 is a mixed bag, but in the end one worth playing for those already invested in the original Tales of Xillia.